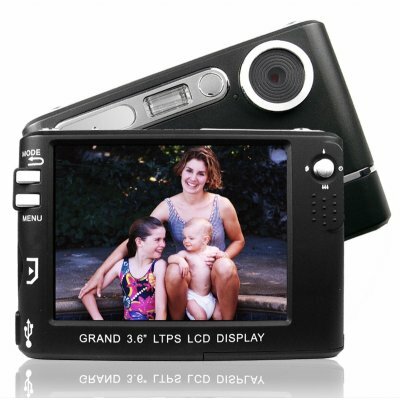 Successfully Added Monster Digital Camera + MP3 Player - 3.6 Inch TFT Display to your Shopping Cart. Record your precious moments for digital prosperity with this 5 megapixel digital camera with huge 3.6 inch viewscreen. This powerful digital camera offers you three different mega pixel sizes to choose from and can shoot video at DVD Quality of up to 720x480 pixels! This camera comes with everything you need right in the box, and can support SD or MMC cards of up to 4GB. For even more fun when you are not busy taking photos and movies, try out the built in MP3 player, included mini games, a MIC recorder, web camera function, and an AV out for viewing pictures right on a TV. This great re-sale item is in stock now and available to drop ship to your customers door tomorrow. on 2009-10-06 19:48:35 Nice camera!